1 What is Manual Therapy? 4.2.1 Different Types of Mobilisation: How Many Glides? 4.2.2 Concave Convex Rule: Up, down, Left or Right? 4.3 How to Choose the Grade: How Far into Range and Quickly or Slowly? 5 Should Manual Therapists Take Blood Pressure? "...the use of hands in a curative and healing manner or a hands-on technique with therapeutic intent...". There is a wide range of disciplines which use manual therapeutic methods to treat and manage pathology and dysfunction as a primary treatment method or in conjunction with other treatments. Physiotherapists are sometimes considered specialists in manual therapy but other professions such as Osteopaths, Chiropractors and Nurses employ manual therapy in treatment. Manual therapy works through a multitude of different mechanisms to be effective and understanding the physiological, neurological and psychophysiological mechanisms is critical to utilising manual therapy clinically in a competent and safe manner. From a Physiotherapy perspective manual therapy is an essential and commonly used treatment method for the management of tissue, joint and movement dysfunction. There are several different main stream approaches to manual therapy; arguably the most common form simplistic form manual therapy used by physiotherapists are mobilisations from the Maitland school of thought. "The Maitland Concept of Manipulative Physiotherapy [as it became to be known], emphasizes a specific way of thinking, continuous evaluation and assessment and the art of manipulative physiotherapy (“know when, how and which techniques to perform, and adapt these to the individual Patient”) and a total commitment to the patient." The application of the Maitland concept can be on the peripheral or spinal joints, both require technical explanation and differ in technical terms and effects, however the main theroetical approach is similar to both. The concept is named after its pioneer Geoffrey Maitland who was seen as a pioneer of musculoskletal physiotherapy, along with several of his colleagues. Accessory Movement - Accessory or joint play movements are joint movements which cannot be performed by the individual. These movements include roll, spin and slide which accompany physiological movements of a joint. The accessory movements are examined passively to assess range and symptom response in the open pack position of a joint. Understanding this idea of accessory movements and their dysfunction is essential to applying the Maitland concept clinically. Physiological Movement - The movements which can be achieved and performed actively by a person and can be analysed for quality and symptom response. Injuring Movement - Making the pain/symptoms 'come on' by moving the joint in a particular direction during the clinical assessment. Overpressure - Each joint has a passive range of movement which exceeds its available active range. To achieve this range a stretch is applied to the end of normal passive movement. This range nearly always has a degree of discomfort and assessment of dislocation or subluxation should be acquired during the subjective assessment. The Maitland concept is a fantastic tool for approaching an initial assessment as it can be used to form a logical and deduced hypothesis about the nature of the origins of the movement disorder or pain. It is worth considering using mobilisations in your assessment process and reading the Initial Assessment section in Maitlands book Peripheral Manipulation. As with any treatment decision a competent and effective assessment is crucial to any patient interaction. 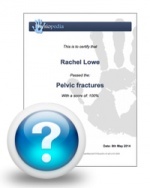 The Subjective Assessment is necessary for determining whether or not mobilisations are suitable for this patient or if they are contraindicated by looking for red flags such as cancer, recent fracture, open wound or active bleeding, infective arthritis, joint fusion and more. The Objective Assessment is an area which the versatile nature of mobilisations becomes clear. Additionally to being a treatment method they are available to the therapist to assess a patients joints and tissues by analysing their extensibility, pain reproduction, bony blocks or abnormal end feels. The Direction - of the mobilisation needs to be clinically reasoned by the therapist and needs to be appropriate for the diagnosis made. Not all directions will be effective for any dysfunction. The Desired Effect - what effect of the mobilisation is the therapist wanting? Relieve pain or stretch stiffness? The Starting Position - of the patient and the therapist to make the treatment effective and comfortable. This also involves thinking about how the forces from the therapists hands will be placed to have a localised effect. The Method of Application - The position, range, amplitude, rhythm and duration of the technique. The Expected Response - Should the patient be pain-free, have an increased range or have reduced soreness? How Might the Technique be Progressed - Duration, frequency or rhythm? To make sure you settle on appropriate mobilisations it is important to get the type of glide, the direction and speed correct. 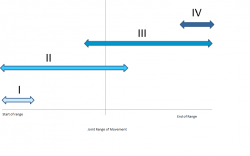 Different Types of Mobilisation: How Many Glides? Concave Convex Rule: Up, down, Left or Right? When a convex surface (i.e Humeral Head) moves on a stable concave surface (i.e Glenoid Fossa) the sliding of the convex articulating surface occurs in the opposite direction to the motion of the bony lever (i.e the Femur). When a concave surface (i.e Tibia; talocrural joint) is moving on a stable convex surface (i.e Talus) sliding occurs in the same direction of the bony level. To improve shoulder flexion you would perform an A-P mobilisation due to the way the convex humerus articulates with the concave glenoid fossa. How to Choose the Grade: How Far into Range and Quickly or Slowly? Lower grades (I + II) are used to reduce pain and irritability (use VAS + SIN scores). Higher grades(III + IV) are used to stretch the joint capsule and passive tissues which support and stabilise the joint so increase range of movement. There are a number of complex systems which interact to produce the pain-relieving effects of mobilisations, subsequnelty there is not a single theory into its mechanism. Therefore this article will outline the basics and evidence for the claims and further links will be added for additional more in-depth information. The pain gate theory (PGT) was first proposed in 1965 by Melzack and Wall, and is a commonly used explanation of pain transmission. Thinking of pain theory in this way is very simplified and may not be suitable in some contexts, however when discussing pain with patients this description can be very useful. The sensation of pain is subject not only to modulation during its ascending transmission from the periphery to the cortex but also to segmental modulation and descending control from higher centres. It needs to be thought of as not just a linear process, instead a complex interaction of a multitude of different biochemical and physical factors which must be thoroughly understood to understand the process and this is why this topic has a page dedicated to itDescending Inhibition. Should Manual Therapists Take Blood Pressure? "Because of the proximity of the vertebral artery to the lateral cervical articulations, caution must be used during manipulation of the cervical spine (MCS). It is thought that stroke can be induced as a result of MCS by mechanical compression or excessive stretching of arterial walls but the pathogenesis of ischemia is unknown." Hypertension ('the silent killer') is common in the developed world due to poor diet, high stress and sedentary lifestyle many people adopt and surprisingly 30% of people may be unaware of its serious consequences. Hypertension is one of the biggest causes of stoke but also can be used as a warning sign for the risk a patient has of having a stoke. Therefore it should be used to ensure there is not risk to a patient by performing cervical manual therapy. Worryingly, Frese et al (2002) surveyed 597 physiotherapists and found 47% of respondants "never measured BP" with 4.4% reporting always checking. The most common reason chosen for the decision not to check BP was that it is "not important for my patient population". This is a concern due to the numbers of people suffering from hypertension, obesity and other known risk factors for hypertension and stroke surely it should be important for any patient population. ↑ van Griensven H, Strong J, Unruh AM (2014). Pain, 2nd ed. Edinburgh: Churchill-Livingstone.